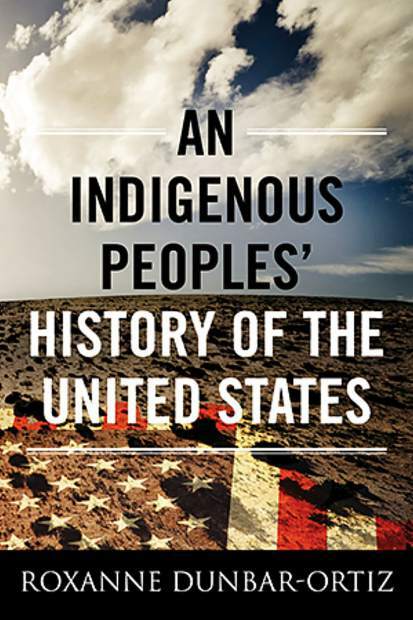 âAn Indigenous Peopleâs History of the United Statesâ by author and activist Roxanne Dunbar-Ortiz. Winston Churchill once said, “History is written by the victors,” which is very much the case when one looks at most chronicles of the earliest days of the United States. It has only been in the latter years of the 20th century that a determination for transparency has grown among scholars who have been looking more closely at the accounts of past events that have long been buried in the accepted narrative of Anglo-Saxon-centric American history. Most renowned of the analytical works of deeper historical research is Howard Zinn’s, “A People’s History of the United States,” published in 1980. The work revealed a forgotten layer of vital perspectives on the American experience, including that of oppressed and marginalized peoples. In her recent and acclaimed book, “An Indigenous People’s History of the United States,” author and activist Roxanne Dunbar-Ortiz builds off Zinn’s premise that the story of the United States includes many dark chapters of barbarity and savagery, and only by allowing those histories to be told, can America move forward. Part Cherokee, Dunbar-Ortiz grew up poor in Oklahoma and worked during the 1960s and ’70s advocating for tribal issues while completing her graduate studies in Native American Studies. She takes that depth and breadth of both personal and academic knowledge and applies it to her weighty contribution to the essential rewrite of American history that is long overdue. Dunbar-Ortiz says that “to learn and know this history is both a necessity and a responsibility to the ancestors and descendants of all parties,” for this nation from “sea to shining sea” has literally been built over the desecrated bones and despoiled sacred places of those who were here first. From the beginning of her heavily researched book, Dunbar-Ortiz establishes the need for the usage of the proper terms for what has taken place over the course of U.S. history. “Imperialism,” “settler colonialism,” “genocide” and “land theft” are all words that matter when writing and studying this history. Throughout her book, she repeatedly emphasizes the importance of being truthful and accurate when confronted with the often-ugly realities of this nation’s past. Dunbar-Ortiz asserts that U.S. history is built upon two themes — prolonged genocide and slavery — and there is “a deep disconnect in the consciousness of U.S. Americans.” But there are numerous documented examples — and she cites them — where the direct intention of colonial actions was the extermination of indigenous populations. Also, assaults on treaty rights have been ongoing, and they continue to this day, cloaked in the modern vernacular of energy independence. Standing Rock and the Dakota Access Pipeline has brought the struggles and rights of the native peoples to the attention of the world like never before, and the battle against pipeline technology has united indigenous peoples across the globe. But long before this modern struggle on the Midwest Plains, and even long before invaders ever reached the Americas, there were centuries of violent incursions by Europeans in directions both south and east of Europe, as they “conducted the Crusades to conquer North Africa and the Middle East, leading to unprecedented wealth in the hands of a few.” Dunbar-Ortiz calls this “profit-based religion,” and it was what proved devastating for the Indigenous peoples of the Americas when those tactics were brought across the ocean. Gold, wealth, common greed and a long-standing sense of racial superiority drove the push to the Americas, and blinded people to the horrors they were perpetrating. She points out that the predominant “Ulster-Scot lineage” of the colonists fed directly into the office of the U.S. presidency. Andrew Jackson and William Henry Harrison, for example, rose to power on the backs of slaughtered Indians and brutalized slaves. In addition, the very nature of warfare in the United States was adapted to fit the Calvinist mold of extermination of non-whites. Indigenous peoples who were not slaughtered outright were often used as pawns — tools to help fight other opposing interests. Peace treaties were established and repeatedly violated, and tribes were driven out of their ancestral homes with no consideration of where they would go. Tribes that refused to submit were destroyed with furious abandon. The genocide of the Indians and the perpetuation of slavery are deeply woven into the fabric of this nation. The cleansing of the past can only come through full acknowledgement of the deep wells of darkness out of which this nation rose. In her powerful book, Dunbar-Ortiz encourages readers to look at the hard truths with open eyes. “While living persons are not responsible for what their ancestors did, they are responsible for the society they live in, which is a product of that past,” she wrote. What Americans are taught about the sanctity of life and the reality of the “red thread of blood” that runs deep into our country’s past are much at odds. “An Indigenous Peoples’ History of the United States” takes important steps to reconciling the two.